Kombucha has many amazing benefits for the body. I went into detail about these benefits in 8 Benefits of Kombucha Tea. It is a fermented tea that is full of probiotics (those good gut bacteria), vitamins, and minerals. Make sure you read all about it. 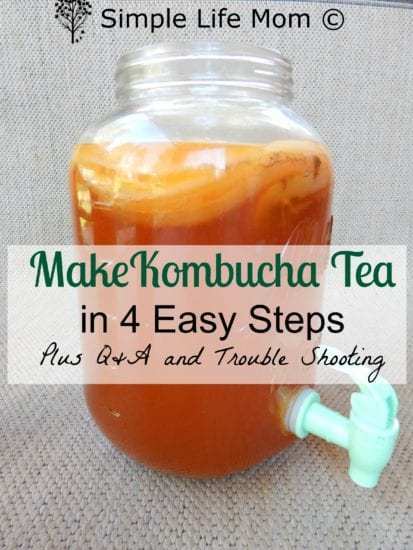 You need to know how to make Kombucha so you can make your own. Knowing the benefits brings a lot of motivation. And it’s easy! Making your own Kombucha is basically like making sweet tea. 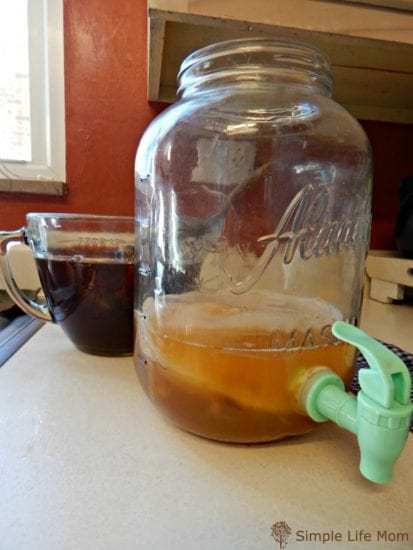 The wonderful part of it is that the bacteria/yeast growth within the tea (the “SCOBY” that grows on top) will eat all of the sugar so that this ends up being a healthy, fermented sugar free drink. Use a bottle of Raw Organic Kombucha as a starter. Make the Sweet recipe below and add the bottle of kombucha. Cover with a thin cloth that will allow air to get to the tea. You should start to see a film develop over the top in 2-4 weeks. After 4 weeks, add a half cup of sugar and stir until dissolved. Allow to grow a few millimeters thick. Use this as your SCOBY and starter to start a new batch as described below. Find a friend who has one. You’d be surprised at how has one at home and just hasn’t brought it up before. The SCOBYs are always growing and needing to be divided, so they should definitely be able to share within a few weeks of you asking them. You can purchase a dehydrated SCOBY starter and kit from stores like Cultures for Health. I’ve purchased Kefir starters from them and am very happy with their products and service. One Gallon glass jug with wide mouth for Kombucha. A valve is nice, but not necessary since it just gets clogged anyway. Metal (especially aluminum) can hurt the SCOBY so use glass and wooden materials. I like to use a large 14 cup glass measuring glass to make my iced tea, but you can use a large jug a well. Pour hot water over 8 tea bags (or use 8 Tablespoons of tea). Stir until dissolved and allow to cool to room temperature. This is very important. You can hurt the SCOBY by adding hot water to it or the starter. Add room temperature sweet Iced tea to 2 cups of starter liquid and SCOBY. Cover with a thin cloth. I use a thin cloth napkin. Allow to ferment for 7-30 days. That’s a big time frame, but that’s because temperature matters. The warmer your home is, the faster it will ferment. Taste it after 7 days. Does it taste different than normal iced tea? Can it ferment more (and you still want to drink it)? The longer you leave it, the more like apple cider vinegar it will get. You need to find your sweet spot. Once it is as fermented as you wish, it’s time to bottle. IMPORTANT: Always leave a 2in head space in your bottles (don’t fill to the top). My current bottles don’t seal very well so I don’t get a lot of fizz, but I’ve heard a lot of stories of exploding bottles. Leave 2 cups of kombucha with your SCOBY as a starter (don’t bottle it all). You’ll use it to get your next batch started later. You can bottle it and put it in the fridge so that the cold causes the fermentation to stop. It will still build a little carbonation over time if you have a good seal on the bottles. You can leave it on the counter top for 2-3 days so it continues to ferment and build up strong carbonation in the bottle. 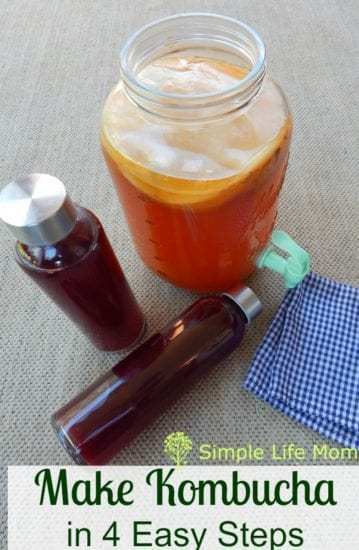 OR you can put the kombucha in bottles and add juice or herbs of your choice. As a beginner, I suggest that you start with a juice like grape or a combination of berry juices or mango pineapple. A good ratio in the bottle is 80% kombucha, 20% juice. Now that you’ve added a bunch of sugar, you’ll need to let it sit on your counter top for 2-3 days so that it the cultures within the kombucha can eat the sugars in the juice. It will maintain the fruity flavor, but lose the impact that the sugar would otherwise give you. It will also build carbonation. 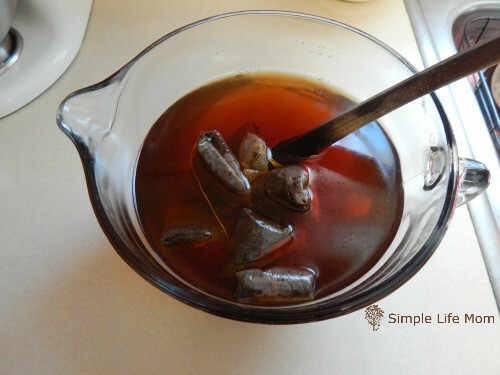 Make the sweet tea as you did before and allow it to cool to room temperature. Pour it into your jug with starter and SCOBY and start all over again. Mark on your calendar when you started your new batch to help you remember how long it’s been fermenting. The longer the better, but if no one’s going to drink it, then less fermentation is better. Kombucha is a very healthy fermented sweet tea. Boil around 10 cups of water (exact amount is not necessary at this point). Add 8 tea bags and sugar and stir until dissolved and tea is strong. Allow to cool to room temperature (important). Add room temperature sweet tea to 1 gallon jug with 2 cups starter kombucha and SCOBY. Cover with a thin cloth so air can reach kombucha. Bottle, leaving 2 in head space so bottles don't build carbonation and break, and refrigerate. If you'd like to build more carbonation, leave sealed on counter top for 2-3 days before refrigerating. Only 4 Steps? That’s it. Sweet tea, fermented, bottled, fermented again with juice and drink! Enjoy. Do I need to clean the Gallon Jug each time? No. It’s just recommended to clean it every few months. Just put the scoby and starter in another container. Be careful to wash your hands well before touching the scoby. My SCOBY is getting huge and taking over the jug. What do I do? Your SCOBY will continue to grow, adding layer after layer. It’s actually easy to peel these layers apart, leaving only one on in your gallon jug. Wash your hands carefully so that you do not introduce germs. put the SCOBY peels in your compost, share them with others, or throw them away. I’m seeing colors in the Kombucha. Is it mold? As the new layer forms on the surface of the tea, you will see multiple milky colors. In all of my experience, the only thing you need to worry about is if there are black spots or any kind of fuzz. Otherwise, you will see colors as the light hits the forming SCOBY. Let me know if I missed anything. I’m happy to answer any questions. Just FYI: I tried to make Kombucha, but mold formed the three times I tried it. I did it in the winter, when my oil furnace was on, and it is basically open to the outside allowing mold spores into the house (built in 1945, and not well, with many large and I mean LARGE cracks that allow weather and air into the house). I was told that using a dehydrated Scoby (like Cultures for Health sells) isn’t always the best and that mold can become part of the dehydrated scoby. I was told to try a hydrated one, that requires NO re-hydrating and that might help produce a Kombucha without mold forming. I have found a hydrated scoby, and plan to try again this summer, when, hopefully, mold spores aren’t as common or ‘active’. Interesting Carol. I know a lot of people who have used both hydrated and non-hydrated to get started and no-one has ever had mold. Make sure everything you have is sterilized before you begin, always wash your hands when pouring or touching the scoby, and make sure to cover with a light cloth. Is there any way I can start a SCOBY of my own at home? Yes, check out the 3 methods for acquiring a SCOBY above. Thank you for the easy to follow instructions, I have been wanting to try making kombucha but it always intimidated me! I am going to use a bottle of kombucha from the store is it ok if it is flavored? Does that mean the only flavor I can have is the first flavor? It is a coconut lime kombucha. It’s better if it isn’t flavored because sometimes the additions can cause some issues with the brewing. I’ve done it before with success though, so you can give it a try if it’s what you have. It will be diluted and then less and less per batch. Thank you for such an informative guide on kombucha Kelly! I’ve been sort of intimidated when it comes to starting my own brew but I think now is the time! Can’t wait to try it at home! I don’t know if after the tea has cooled, I should leave the tea bags or loose tea in the jar with the sugar and the scoby to ferment. Remove the tea bags and discard after the tea cools. What does the “black” spots mean if it forms? I have some forming on the sides of my SCOBY. Should I be worried and what should I do about it? That does sound like mold. I would start over. Is there a scoby section that you can remove that has no spots? A friend gave me a scobi, but not sure what a started is? Is this something besides the scobi? A starter is kombucha. You can buy a bottle of plain, pure kombucha as a starter, but if you don’t you can still get going with your Scoby and iced tea. It will just take longer for your first batch to ferment. Just grab and layer and pull 🙂 The layers pull apart pretty easily. I always thin mine down to about an inch. Compost the rest. A new scoby will form to the size of the container you have a well. My scoby keeps sinking to the bottom of my jar when I place it in the tea. Is that ok? Is it super thick? You can peel layers off and it should be thin enough that it floats at least at an angle. I pour tea into my starter and scoby and it never lays across the top perfectly, but it is not fully on the bottom either, just crooked. Have you ever tried to make Mead from your kombucha tea? How long should I leave the tea bags in the hot water for? I just leave mine until it cools, but 10 minutes is long enough. Can you use honey instead of the sugar? Yes you can use honey. Raw honey does have it’s own bacteria culture, which can effect the brew, so you’ll have to keep an eye on it, but I know many people who love to use honey instead of sugar cane.